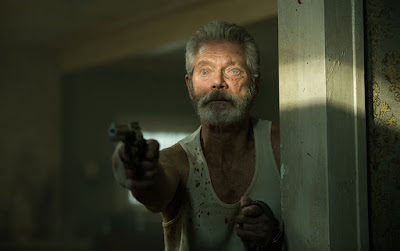 There was always something about Fede Alvareze's Don't Breathe that had it looking like a summer horror hit, similar to M. Night Shymalan's The Visit last year. The blockbuster months have proven a surprisingly fertile ground for the genre lately, and this year has been a great one period for smaller scale horrors. The invasion thriller opened with a huge $26.1M, huge when you consider it cost $9M and boasts only Jane Levy as a semi-bankable star. Then again, she wasn't able to push Alvarez's Evil Dead remake to soaring levels so maybe this isn't at all about her. The film centers on three young criminals who rob the wrong blind guy's house, as he turns out to be pretty damned deranged and psychotic in his own right. The premise was simple and catchy with the promise of a ton of thrills, but it's got some decent twists in there, too. We'll probably have Don't Breath 2 Heavy or some other sequel in a year or something, so do yourself a favor and get in on the ground floor. Just stop listening to the idiots telling you the movie was a flop. At $635M total it's anything but. The good news is Laika's latest stunning animated achievement, Kubo and the Two Strings, had one of the best second week holds, dropping only 37% for $7.9M. The bad news is it cost $60M and the debut was so low that it might not matter. For one of the year's most enjoyable and unique experiences this is one you need to see. Really? $7.5M? For some reason that doesn't seem too bad for the unwanted sequel Mechanic: Resurrection, a follow-up to arguably Jason Statham's best film. Perhaps it's because most Statham movies open around that number, anyway, regardless of the star power he's surrounded by. The first film arrived in 2011 with little fanfare, as nobody seemed to care it was a remake of the Charles Bronson 1972 movie, and there's even less attention on 'Resurrection', which seems wholly unnecessary. Clearly Lionsgate/Summit didn't care, either, because they didn't even bother to screen it for press in most cities, which is why we don't have a review. Eventually one of us will get around to paying for it, but by then who's going to want to spend time writing about it? If you've seen it and want to drop a few words, let us know. Not much war, and absolutely no dogs anywhere. Perhaps it was all of the false advertising that hurt the struggling War Dogs? Well damn, that escalated quickly. Or maybe de-escalated since Ben-Hur has nearly fallen off the track in just week numero dos? Paramount is eating chariot exhaust on this one with reports the film could lose between $60M-$100M when the final figures roll in. Right now it sits at $41M worldwide. No doubt the hotly-contested Presidential campaign helped boost the numbers for Southside with You (review here), a fictionalized account of Barack and Michelle Obama's first date. It's a movie I saw months ago and had love for then, so I take great pleasure in its $3M debut on only 813 theaters. The Roberto Duran biopic Hands of Stone (review here) folded like Glass Joe, opening with only $1.7M on 810 sites.